Perhaps you enjoy finding your way around Myrtle Beach each day as you drive to the different golf courses that you will be playing during your Myrtle Beach golf package. If that’s not your idea of fun, you might want to entertain the idea of staying at one of the Myrtle Beach golf resorts for your next golf getaway. There are a few reasons that you choose a Myrtle Beach golf resort: everything is in one location, and it’s probably the easiest way to get 36 holes played in a day. There are a few Myrtle Beach golf resorts that have several courses that make this possible, that range from high end courses to bargain packages. Here are a few Myrtle Beach golf resorts that we suggest. When these four big named designers brought their style to the 4 distinctly different courses at Barefoot Resort, the Grand Strand's golf landscape changed forever for the Myrtle Beach golf resort: Fazio, Dye, Love III and Norman (the Dye course is just down the road a bit from the other three, but still in Barefoot Resort). Both the Fazio and Love golf courses are consistently ranked among the best that Myrtle Beach's has to offer, while the Norman course features beautiful water views. The semi-private and pricey Dye course at this golf resort is one of the area's toughest, and has a large number of bunkers, which Pete Dye is famous for. 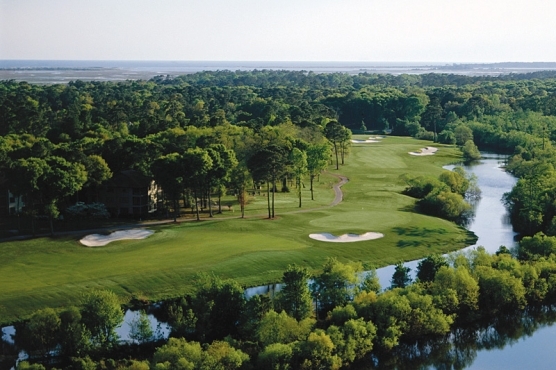 The most requested course at this Myrtle Beach golf resort is King's North. The course, designed by the late, great Arnold Palmer, was redesigned and upgraded a few years ago and is as signature of a layout as there is, complete with the island fairway risk/reward par 5 and the island green par-3 12th hole with the "S.C." bunkers. This Myrtle Beach golf resort also features 2 other courses, the West Course and SouthCreek. The West Course sits next to King's North and features the same type of landscape, just not flashy-ness of King’s North, while SouthCreek is a shorter course around homes that rewards an accurate shot. This Myrtle Beach golf resort is located on Highway 501 and offers three good golf courses in the intermediate price range. Each design is quite different from one another. The Heathland course at Legends was modeled after the links overseas, where the style of Scotland is captured pretty well given the softer soils found here along the Grand Strand. The Mooreland course is a tournament-style course consisting of deep and dramatic bunkering, steep railroad ties and green complexes. The Parkland course is the longest of the three courses, and you will wonder if you are at the beach or in the woods. Ocean Ridge got bigger back in 2009 when they opened Leopard's Chase and Jaguar's Lair. This Myrtle Beach golf resort features 3 other courses for a total of 5. Lion's Paw and Panther's Run, are good options for the higher handicappers in your golf group. Tiger's Eye, which has a lot of of elevation change, is still considered one of designer Tim Cate’s top courses, and will impress every skill level. Sea Trail Resort consists of 3 golf courses, one designed by Rees Jones (the Jones course), one by Willard Byrd and the flagship course from Dan Maples. This Myrtle Beach golf resort is located in Ocean Ridge Plantation just north of the Myrtle Beach area in North Carolina. This Myrtle Beach golf resort has something for everyone, even a 3 night, 6 round package for the die-hard golfer with lots of rounds to play, but not a lot of time.